I have been researching the Mediterranean diet for months. In this post I will present three of the frequently overlooked points about the Mediterranean diet: ratios of food types, fasting and food preparation. 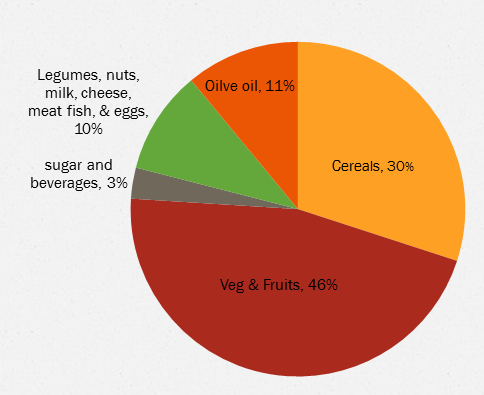 The traditional Mediterranean diet is characterized by a high intake of vegetables, legumes, fruits and nuts, and cereals (that in the past were largely unrefined), and a high intake of olive oil but a low intake of saturated lipids, a moderately high intake of fish (depending on the proximity of the sea), a low-to-moderate intake of dairy products (and then mostly in the form of cheese or yogurt), a low intake of meat and poultry, and a regular but moderate intake of ethanol, primarily in the form of wine and generally during meals. This description is not incorrect. However, it is misleading as it misrepresents the Cretan diet of that period. Before proceeding with the three frequently overlooked prospectives of the Cretan diet, I need to mention that I am basing my information on the only firsthand data available. It is based on an extensive epidemiological study conducted in 1948. The data was published in a book by the chief investigator Allbaugh in a book titled: Create a Case Study of an Underdeveloped Area. Shockingly: the combination of fish, meats, poultry, legumes, nuts, dairy only represented 10% of consumed food by weight! Fruit and vegetables represented 46%. Check the accompanying pie chart. The facts that they ate barley as much wheat and that they consumed whole grains should not be overlooked. The NEJM article stating that they had high intake of legumes and nuts and moderately high intake of fish is not true for Crete. It is only true if you compare it to the American diet of that time. Fasting meant going vegan (nothing from animal source) for a whole day. According to another paper by Sarri et al. (2008) fasters also avoided olive oil in most of the fasting days. Cretans fasted twice a week, 40 days before Christmas, 48 days before Easter and 14 days in August. Allbaugh did mention that although most watched the weekly fasts, less watched the other fasting periods. The main method was boiling and stewing. This meant that the temperature of food during preparation did not exceed boiling point. They were only able to cook one meal a day. The remaining meals constituted bread with olives, olive oil and other dips, and leftovers. Worth mentioning is that Cretans did not have refrigerators and thus ate fruit and vegetables in season. By today’s standards their method of agriculture would be considered organic. I conclude by stating that we often relay on second hand knowledge and information as the misleading blanket statement in the NEJM article. However, if you go and explore the data firsthand you will find it rewarding and surprisingly rejuvenating. Allbaugh, L.G., 1953. Crete: A Case Study of an Underdeveloped Area. Princeton University Press. Renaud, S., Lorgeril, M. de, Delaye, J., Guidollet, J., Jacquard, F., Mamelle, N., Martin, J.L., Monjaud, I., Salen, P., Toubol, P., 1995. Cretan Mediterranean diet for prevention of coronary heart disease. Am J Clin Nutr 61, 1360S–1367S. Sarri, K.O., Linardakis, M.K., Bervanaki, F.N., Tzanakis, N.E., Kafatos, A.G., 2004. Greek Orthodox fasting rituals: a hidden characteristic of the Mediterranean diet of Crete. Br. J. Nutr. 92, 277–284. Trichopoulou, Antonia, Tina Costacou, Christina Bamia, and Dimitrios Trichopoulos. 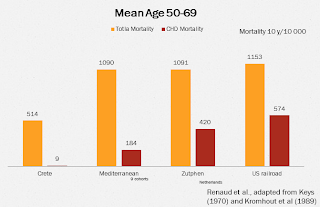 “Adherence to a Mediterranean Diet and Survival in a Greek Population.” The New England Journal of Medicine 348, no. 26 (June 26, 2003): 2599–2608. Very interesting! Nice to see someone trying to get to the truth and just what he/she can turn up. After reviewing all the research I could find on fasting, I was astonished at all the health benefits that fasting offers. Do you remember in the late 1990’s when the Mediterranean diet became all the rage? The idea behind the diet was based on research conducted in Crete (Greece). The research suggested that the diet of the Mediterranean region was superior to the North American diet. On average, the Cretes were healthier than North Americans, with less incidence of cardiovascular and heart disease. Researchers attributed this improved health to a high daily intake of whole grains, fruits, vegetables and olive oil. That made pretty good sense as these are all accepted ‘healthy’ foods. However, recent reviews by a group of researchers at University of Crete, School of Medicine suggest that one very important factor was left out of this research. In the Greek Orthodox Christian Church there are some very lengthy fasting recommendations25. The Orthodox Church specifies a combination of dietary restrictions and fasting for a total of between 180 and 200 days out of every year. While this is by no means conclusive evidence, it did suggest that a very healthy group of people were not only consuming plentiful amounts of healthy foods, but also took part in routine periods of fasting26. By the time I had finished my research, I had come to the conclusion that short term (one to three days) intermittent (never in a row) fasting, was not only an effective and easy way to cut calories and thus lose unwanted body fat, but it was also associated with many amazing health benefits. I apologise for the delay in approving your comments. I need to change my settings to be alerted about comments. Thank you for the link.